Recently I was working on an Exchange UM and Cisco Call Manager integration. 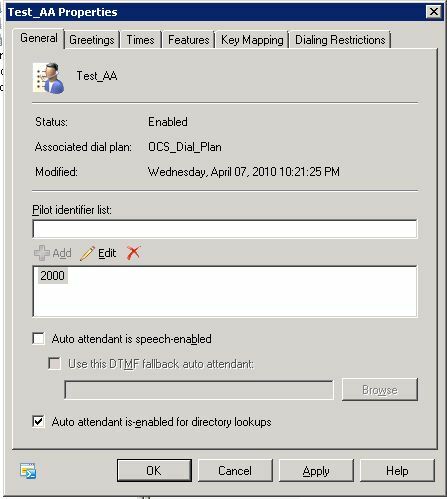 The company who already owned Exchange E-CALs wanted to upgrade to Exchange 2010, and as part of the process we discussed having Exchange handle the voicemails instead of Cisco Unity which was not supported with Exchange 2010 at the time. Another big advantage was the customer could stop paying the “Cisco Tax” on Unity just by using what they already had in Exchange server and client licensing (over 15k in savings year one). We called into the attendant and heard the company’s greeting as expected. However, the file specified to be used for the main menu prompt wasn’t playing. Instead we heard the exchange default greeting. I double-checked the auto attendant configuration but the custom file was definitely specified. I spent a few minutes recreating the attendant and restarted the UM services just in case, but I still got the default “Main Menu Prompt”. At this point I thought maybe it was a problem with the second WAV file, so for testing I assigned the custom company greeting file that was working to both prompts for a test. That didn’t work either-now I’m perplexed. I copied the WAV files over to my lab and tested there and I received the exact same problem. When all else fails read the instructions, right? So I headed out to TechNet to read through this article. In the table “UM auto attendant greetings, informational announcement, and menu prompts” I see the answer to my problems. Once this was in place, the custom main menu prompt played as expected. 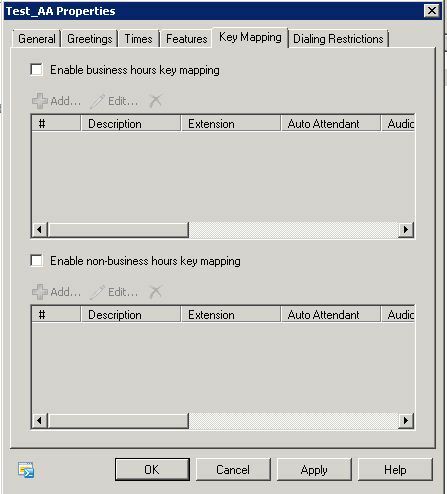 Although this is expected behavior (as noted in the TechNet document) it isn’t intuitive behavior! It would be great if there was a pop-up box or note on the “Greetings” tab that alluded to this requirement, or if the requirement is removed. 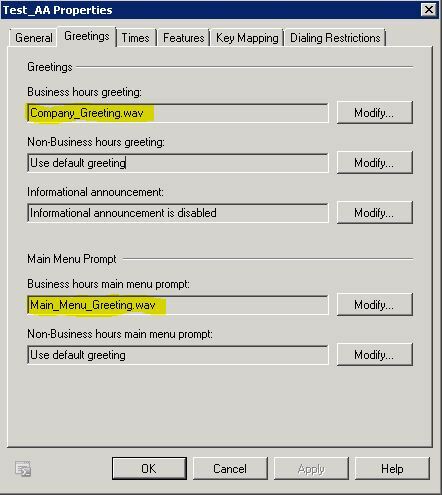 In some cases customers may not want any custom key mappings in their auto attendants but may still want to play custom main menu prompt greeting files. Admittedly this is the first time I’ve run into a customer with this requirement, but it will almost certainly happen again to someone out there and most of us don’t have time to read all the TechNet articles out there for something that should be intuitive. This entry was posted in Uncategorized and tagged Exchange Auto Attendant, Exchange UM, Exchange Unified Messaging, OCS as a PBX, UM, UM Auto Attendant, Unified Messaging, Voice. Bookmark the permalink. I am a regular follower of your Ocsguy blog. I have worked a lot with Exchange 2007 but very new to OCS. First of all thanks for reading (and adding me on twitter)! When I say “Cisco Tax” I meant the yearly maintenance the customer had to pay to continue getting updates for Unity from Cisco. For this customer they were paying for both Microsoft Software Assurance on the E-CAL suite and Cisco SmartNet. 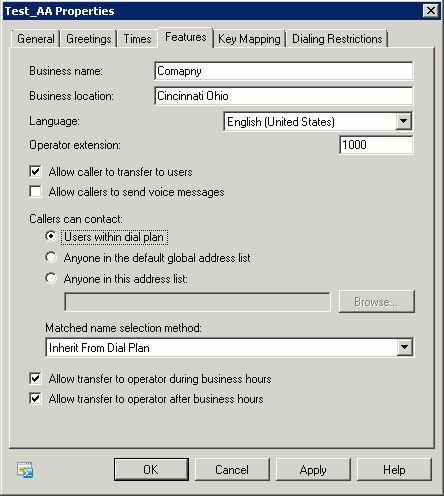 The E-CAL suite gave the client the rights to use Exchange Unified Messaging as a voice mail platform with no additional cost. 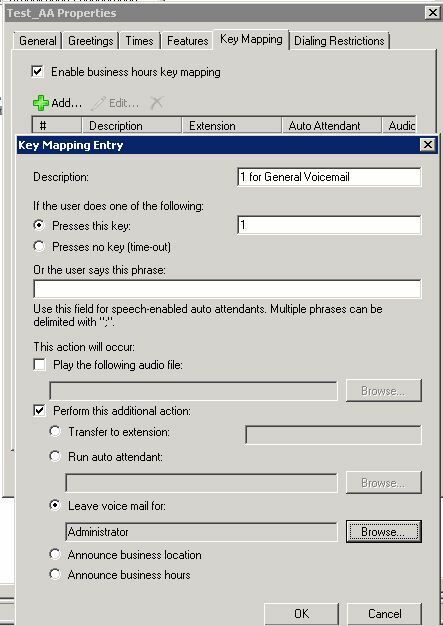 Once they moved voicemail away from Unity they no longer had to pay the annual maintenance cost on Unity, saving them over $15,000. Please let me know if that is clear, and thanks again for reading!